Does Your Business or Corporation Have a Custom Lapel Pin? Let’s take a moment to visualize a scenario. You’ve sent a trusted employee to a convention or business luncheon. She’s doing an amazing job selling your product, or describing your services, or making connections with potential investors. She looks great—confident and smart in her power suit. She’s speaking eloquently. Then, the meeting comes to an end, hands are being shaken, promises made. Someone then asks your employee for her business card. She grimaces—she doesn’t have any to give. She scribbles down her contact information on a napkin or scrap of paper. Obviously this would leave any client, customer, or investor with a reduced impression of any company. Business cards are just standard practice. Not having a business card would seem incredibly odd in this day and age. But start imagining again. This time, your employee has her business card in hand moments after she’s asked for it. The investor or client looks at it, and his eye is caught by your striking company logo. He’s seen it before. He looks up—and realizes he is already familiar with your company’s brand identity because your employee has been wearing a custom lapel pin with your logo the entire time. It shines on the lapel of her suit, perfectly echoing the stationary, business cards, and other branded materials. People wear lapel pins for all sorts of reasons, but the unifying theme in lapel-pin usage is pride. When you see someone wearing a lapel pin, you assume they support that organization, club, country, team, whatever the case may be. One would never assume the opposite. Therefore, when you get custom lapel pins for your employees, and they wear them out into the world, anyone they encounter in a business situation will make an unconscious positive association. They’ll likely think that the employee must enjoy working for your business—that they feel like “part of the team.” After all, you have to take the time to put on a lapel pin, and the idea that an employee of your company would take that time while preparing for a meeting is sure to impress everyone around the table. When you have custom lapel pins made for your employees, they will also wear them to the office, creating a sense of belonging and community. They’ll enjoy the sense of community the shared jewelry produces. Remember, branding often takes business to the next level. Marketing experts agree that visibility is the most important aspect of branding. Having your logo repeated consistently in the office and outside of it will only help raise general awareness of who you are and what you have to offer. 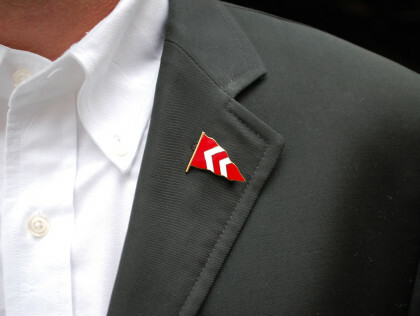 Custom lapel pins are a unique and beautiful way to drive that message home! This article brought to you by Custom Pins Inc. in Westchester, NY. Whatever your design, logo, or business branding purpose, we can create custom lapel pins for your employees. Click here to fill out our Free Quote form. Or call us toll free at (888) 922-9378 for answers to all your questions about custom pins, custom lapel pins, and more!